Please ensure that the UPS is disconnected from every power source or output. Also ensure that the UPS itself is switched off. Slide the battery cover open. If it is screwed down, unscrew the cover gently. Carefully loosen both the terminals & gently remove the battery. You need to be careful so that you do not break the wiring or terminals. Replace the old battery with your new SF Sonic UPS battery. Connect the terminals as instructed in the manual provided. Generally the red wire is connected to the positive terminal while the black is connected to the negative. However reading the manual is always advisable. Ensure that the terminals are connected nice and firm so that they do not get loosened easily. Gently slide the battery inside and make sure that no wire is sticking out or oddly angled. Screw the cover back or slide it back. Turn on the UPS to check if the battery is providing power. If not, then connect it to a power source and turn the UPS back on. If it is still not working, you need to recheck the wirings again. 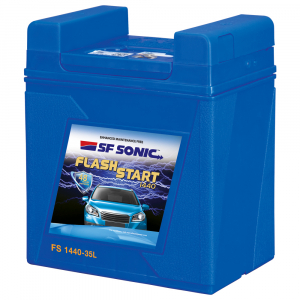 SF Sonic provides its batteries with PWM (Pulse Width Modulated) technology which help you in saving a lot of battery power. With our advanced ASIC technology we provide long lasting and hassle free battery service. Our DSP (Digital Signal Processor) also provides excellent grid quality electricity for all your appliances. So if you are looking for a replacement, you should trust only SF Sonic for enhanced and efficient performances. In case of any assistance you can contact our emergency support team (1800 102 6060). You can also try our range of home and office UPS systems which have a variety of added features to enhance UPS battery life and indicators to inform you when a replacement is required or when it has to be recharged.